Figure 3. 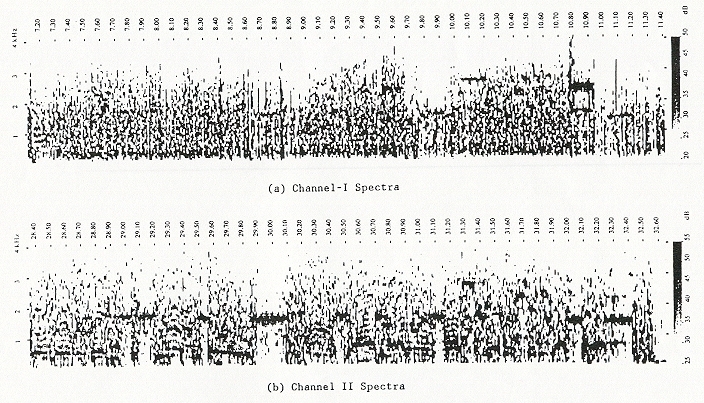 Spectra of Channels I and II for the "Hold-Everything" segment. The horizontal axis is time (seconds) and the vertical axis is frequency (kHz). The grey intensity-scale (dB) is indicated at right. Note the reduced Channel-I spectral intensity following the two heterodynes (9.52 to 9.64 and 10.78 to 10.95 secs).